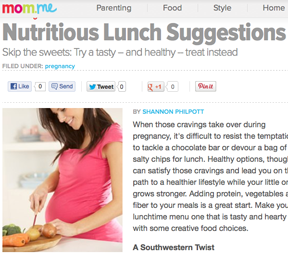 When those cravings take over during pregnancy, it’s difficult to resist the temptation to tackle a chocolate bar or devour a bag of salty chips for lunch. Healthy options, though, can satisfy those cravings and lead you on the path to a healthier lifestyle while your little one grows stronger. Adding protein, vegetables and fiber to your meals is a great start. Make your lunchtime menu one that is tasty and hearty with some creative food choices.